Today's featured designer is Alicia of Swoon Sewing Patterns. Alicia offers dozens of meticulously written bag patterns, for styles ranging from wallets and clutches, to duffel bags, and everything in between. 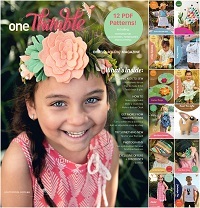 Several of the patterns are even free! 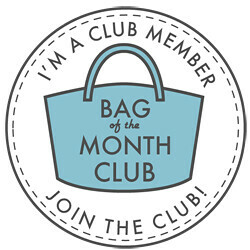 Alicia also takes part in the Bag of the Month Club, which features exclusive designs available only to members. I've been sewing for around 10-15 years. I'm not sure exactly when I started but my mom gave me a sewing machine for Christmas. I had no idea what to do with it! As far as pattern making goes, I used commercial patterns for years. I made clothing, curtains, bags. I got stuck on making bags for a long time and had the idea to make my own super simple pattern. I was a graphic designer so it wasn't too difficult. I drew the diagrams by hand, finished it, uploaded it for free on Craftsy. Currently, the freedom. I had a baby a few weeks ago and it allows me stay home with him and work (when he lets me). The initial drawing of the pattern pieces is usually the most complicated. I often have to draw and then sew test bags at least three times before it's just right. Bags are a lot of work, very time consuming. But you can use it every single day. And it always fits. It changes too often to commit to one. I've been carrying a Pearl Wallet since the pattern was released and still love it just as much as when I made it. Necessary Clutch Wallet by Emmaline is brilliant. And all Amy Butler patterns! We have three kids, silence is golden. The Facebook group is a great resource for help! I try to keep promoting to a minimum outside the group. Word of mouth is best. Enter to win a prize pack of PDFs from each of the designers featured in this series, check back each day for another entry! I started my bag making with Swoon patterns and 3 years later Swoon Patterns are still my favourite patterns. I love being part of the ever helpful and inspiring FB group too. I love Swoon patterns! They were the first ones i stumbled upon when first sewing bags. I remember thinking wow this is great and way better than commercial patterns! I'm always anticipating the next pattern release!! I love her patterns! The construction methods are amazing! I can't sew a straight line or around a curve well but these patterns make me look like a pro! I have a few Swoon Patterns. They are fantastic! In fact, that makes me think, I've got to get one out and sew another bag! I started with Swoon Patterns and never looked back! Every one is detailed, easy to follow, and comes together perfectly. Alicia has such great bags! I have been very tempted by the Weekender and the larger Brooklyn for short trips to visit my daughter. The weather is great, the sun is shining--NO MORE excuses :) And--Alicia--thank you for all the great free patterns, too! Swoon has some great bag patterns. I love Swoon! I own them all! I started with Swoon ....just love,the patterns! I love the simplicity of Swoon Patterns, Alicia is a great designer. She is the very reason I started sewing purses. Just started Swooning! I am hooked! Fan for life! I first heard of Swoon from Reece years ago, she's the one who inspired me to try a had at bag making. I'm currently using my latest bag, Ethel as my everyday purse, I love it. I love Alicia's (Swoon) patterns as her instructions are very clear and logical. Thanks Alicia! Very new to bag masking but have a few of Alicia 's patterns to try out. They're beautiful! I love Alicia's patterns! Well written, affordable, and always turn out well. I have not used any Swoon patterns yet, but I have a few downloaded and am excited to try them. They look like they are really organized well and have great instructions. Swoon patterns are some of my favorites! Love Swoon patterns! I started making them about a year ago. I love how easy to follow Alicia's patterns are. Love, love, love Swoon patterns. Tried a couple of other patterns first and just about gave up. Swoon is my very favorite. I never knew that making a bag could be so easy! i love swoon!!!! Love Swoon patterns, they are so well thought out, brilliantly explained and laid out and work perfectly! I'm currently in the middle of making a Lola and I can't wait to see the end result, then will be onto my first pearl! I just love Alicia's patterns: they look so professional and beautiful! I still have to find the time to make my first Swoon, but I have the patterns ready. I just love them! Love Swoon Patterns and Alicia is kind and giving. My fave! I've been using Swoon patterns since they were Paco Bean, and I own all of them (except Louise yet) and have sewn most of them up. I love the clarity of instructions and the details put in to these patterns. I absolutely adore Swoon patterns, great bags to make! My first bag was okay, but my second bag was a Swoon (Evelyn), the difference was phenomenal, it looked professional and polished. And it got me hooked on bag making. I love Swoon patterns!! Super easy to follow and there is so much help if you get hung up on something! I LOVE Swoon patterns. I recently got into bag making. I have been making clothing. I started with Swoon bags and I got hooked!! Her patterns are so well written, and they look amazing completed.